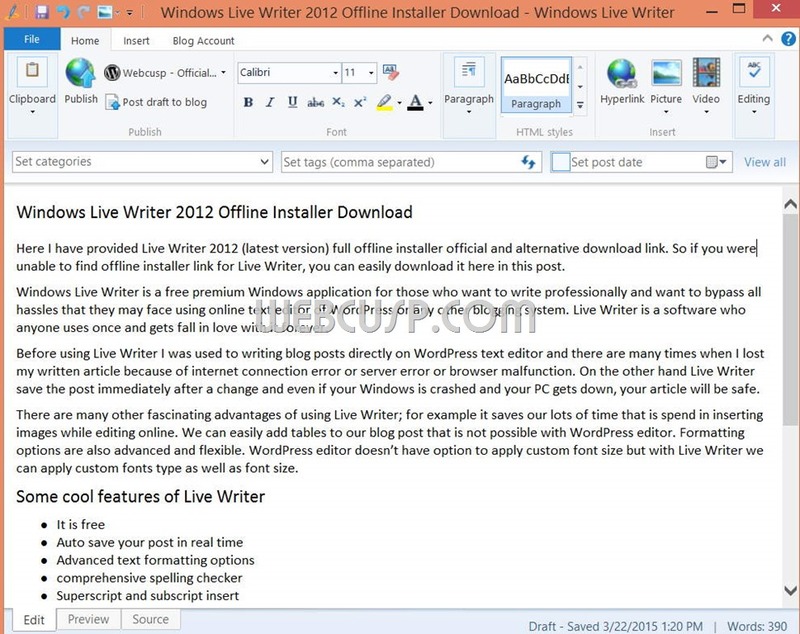 Here I have provided Live Writer 2012 (final version) full offline installer official and alternative download link. So if you were unable to find offline installer link for Live Writer, you can easily download it here in this post. Windows Live Writer is a free premium Windows application for those who want to write professionally and want to bypass all hassles that they may face using online text editor of WordPress or any other blogging system. Live Writer is a software who anyone uses once and gets fall in love with it forever. Before using Live Writer I was used to writing blog posts directly on WordPress text editor and there are many times when I lost my written article because of internet connection error or server error or browser malfunction. On the other hand Live Writer save the post immediately after a change and even if your Windows is crashed and your PC gets down, your article will be safe. There are many other fascinating advantages of using Live Writer; for example it saves our lots of time that is spend in inserting images while editing online. We can easily add tables to our blog post that is not possible with WordPress editor. Formatting options are also advanced and flexible. WordPress editor doesn’t have option to apply custom font size but with Live Writer we can apply custom fonts type as well as font size.